Mid-States Campers Offers Top-of-the-Line Keystone Vantage Travel Trailer RVs for Your Summer Vacation. Discover the bright and spacious qualities of the Keystone Vantage travel trailer from Mid-States Campers, perfect for your summer vacation. As soon as someone steps through the door of a Keystone Vantage, they'll know that the Keystone Vantage is something new and different in the world of travel trailers. Bright and spacious, this travel trailer’s 7-foot vaulted ceiling gives the impression of much larger space. Contemporary fabrics and finishes add to the feeling of streamlined elegance. More like a modern apartment than a camper, it has instant appeal. The gourmet kitchen also has a deep-bowl, stainless-steel sink with a residential pull-out sprayer for easy cleanup, a stainless-steel 6-cubic-foot refrigerator, three burner range and microwave. The tall panoramic window above the sink lets in lots of natural light and scenic vistas. The bath in the Vantage also has a luxury feel to it, with a large Super Suite tub and shower, complete with an overhead skylight and a porcelain foot flush toilet. The vanity sink cabinet is constructed of the same glazed maple found in the kitchen and has plenty of storage space. A mirrored cabinet above the sink is attractively designed with both open and closed shelves. A large lighted closet in the hallway and a full-height mirrored closet in the bedroom round out the abundant storage solutions provided by this superlative travel trailer. At the end of a day spent outdoors or on the road, the Queen-size bed is comfortable and roomy, perfect for recharging yourself for what the next day may bring—and full black-out window shades ensure privacy. In the living area adjacent to the kitchen, there’s a 32-inch HDTV and AM/FM/CD/stereo to enjoy when the weather precludes outdoor activities. The sofa easily opens into an air bed for guests and the dinette can also be converted for sleeping. Handfuls of travel trailer reviews reveal that Keystone Vantage is an impressive travel trailer RV, inside and out. If travel trailer value, comfort and convenience are important to you, whether traveling cross country or just getting away for the weekend, it’s worth taking a look. 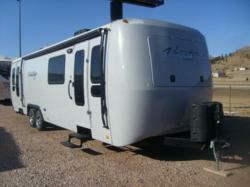 Check out our inventory online here: [http://www.midstatescampers.com/page/keystone-travel-trailers .